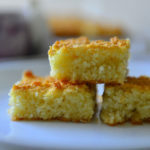 Wattalappam is a popular Sri Lankan dessert. The first time I came across it was years back in a small bakery by the beach in Kerala. Ports of Kerala and Tamilnadu had commercial ties with this island nation and many of these Sri Lankan recipes found fans among us. For us ingredients were familiar but the interpretation was different and a welcome change. I had forgotten about this dessert until I spied it on the GRT menu a few years back. We were enroute to Kochi from Bangalore. GRT at Selam was our favorite spot to break the journey. Sit down , grab an quick lunch and be on our way. But spying this on the menu changed the schedule. It took longer than we expected , and my family looked at it and wondered what is so special about this ‘blah’ looking thing. The traditional wattalappam is a brown custard, usually un adorned. It is quite ordinary looking and will scarcely win any presentation points. But don’t be deceived by its looks – the taste is complex, the texture soft and sooth and everything just melts in the mouth. Taste of jaggery is an acquired one. It is not just sugar , there is calcium and trace minerals in there, not to mention a whole world of flavors. The typical south Indian jaggery is made with cane juice while the one used in this recipe – kithul jaggery is made form a variety of palms. Palm jaggery is usually a good source of calcium and iron and tastes very different from sugar. 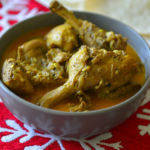 Here are all the ingredients for this recipe – jagery , coconut milk , eggs and spices. The dark brown, almost black looking block in the picture is kithul jaggery. I used a grater to grate it. The powdered version will look much lighter. Grating it is a little bit of work – it is the hardest part in this recipe. Use a grater, or knife or cut it into smaller chunks and pulse in the blender – that is if you have a heavy duty blender. Kithul Jaggery is usually available in stores selling Sri Lankan groceries. I would suggest that you definitely use the powdered version, if you are lucky enough to find it. The spices used could very from cook to cook. Some prefer it without any spices, but cardamom, cinnamon, cloves and nutmeg are the popular spices to add. Use one spice or a combination of spices. Usually freshly ground spices are used and a little goes a long way in this recipe. It may not be easy to find Kithul jaggery if you don’t live near a Sri Lankan store. Kithul jaggery is darker jaggery than the traditional Indian ones and even a shade darker than piloncillo that I usually find here. The good news is that you can pretty much substitute any Asian jaggery or piloncillo or panela or even dark brown sugar. This is as true to the traditional home made recipe as I can get. As recipes go it is an easy one. The recipe and ingredients are very much similar to that of a flan but unlike the flan the margin of error is very little. Here you mix all the ingredients for the custard together and just bake or steam . The steps to make wattalappam are as follows. The biggest risk in this recipe is not getting the custard smooth. So it is important to strain the custard and pour into the waiting molds. You can use fresh squeezed coconut milk – this recipe will use about ¾ of a coconut or use canned coconut milk. Follow the link to see how to make coconut milk at home. If you are making fresh coconut milk – use the first extraction for this recipe. I have baked these in a water bath (bain-marie), but the home made versions were usually steamed. I like the baked version a little better , because I am baker ! Not really, the baked versions seem a little firmer to me (just my personal opinion) and it is easier to bake. Whether baked or steamed, wattalappam tastes good. Wattalappam can be served warm, but allowing it to cool and refrigerating for a few hours allows the flavors to mature and mellow. 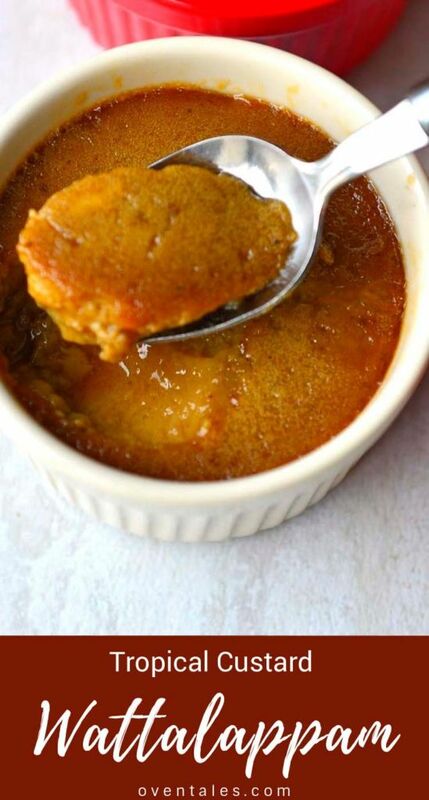 This is the recipe to make for someone who is lactose intolerant but still a lover of flan ! So here is the recipe for Sri Lankan Wattalappam. Think of wattalappam as a tropical cream caramel. This is a perfect custard for those with milk allergies. 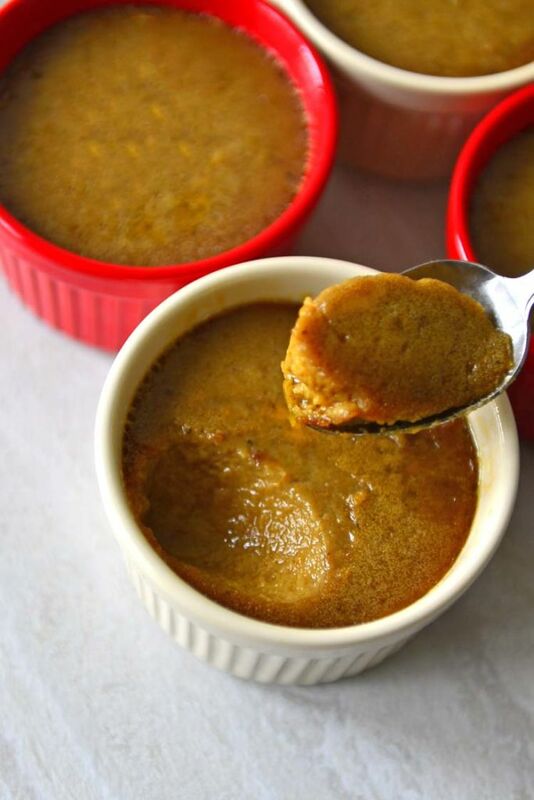 It is a a popular Sri Lankan custard made with eggs, coconut milk and jaggery. Jaggery gives it more earthy, caramel like flavors and the brown color. 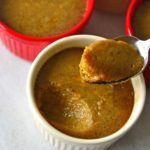 Coconut milk and jaggery are a typical dessert pairing found in many of desserts from that region, and works beautifully here. Pre heat the oven to 350°F (170°C). Lightly grease 4 one cup custard molds. 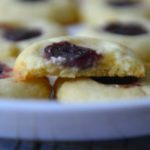 Place them in an oven proof container . Heat about 4 - 5 cups of water. Mix ¼ C of coconut milk with the jaggery (notes) and mix into a smooth paste. Add the eggs and the yolks into the jaggery mix and beat until mixed well. The mix should look uniform and seems to have thickened and bulked a bit without air pockets in it. Powder the cardamom seeds (about 1/2 Tsp powder) and grate the nutmeg a few times to make about ¼ tsp powder . 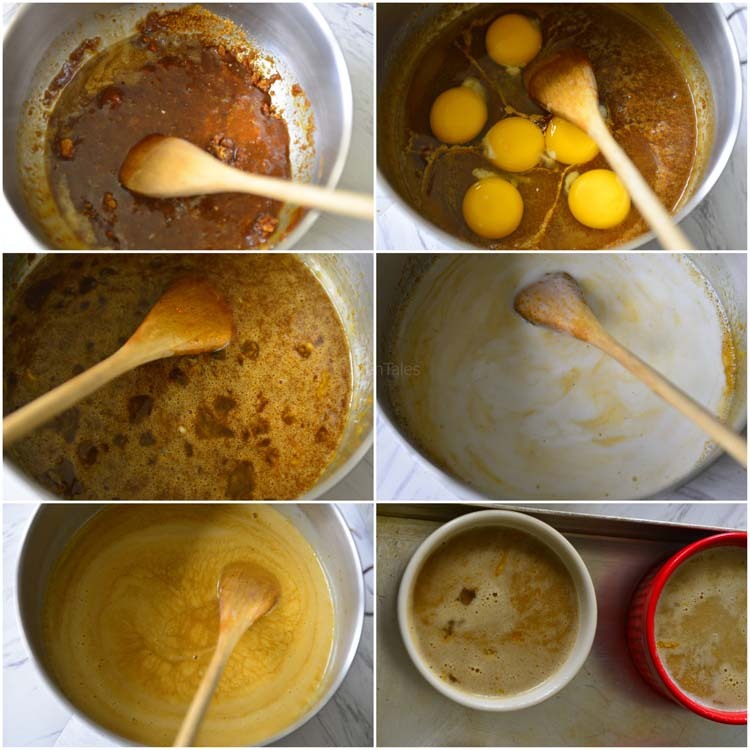 Mix the spices with the jaggery egg syrup. Add the coconut milk and mix with a spatula. Strain the mix and portion into the prepared custard cups. 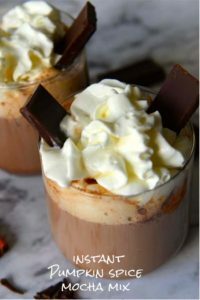 Cover the tops of the cups with foil. Pour hot water about into the pan holding the custard cups. 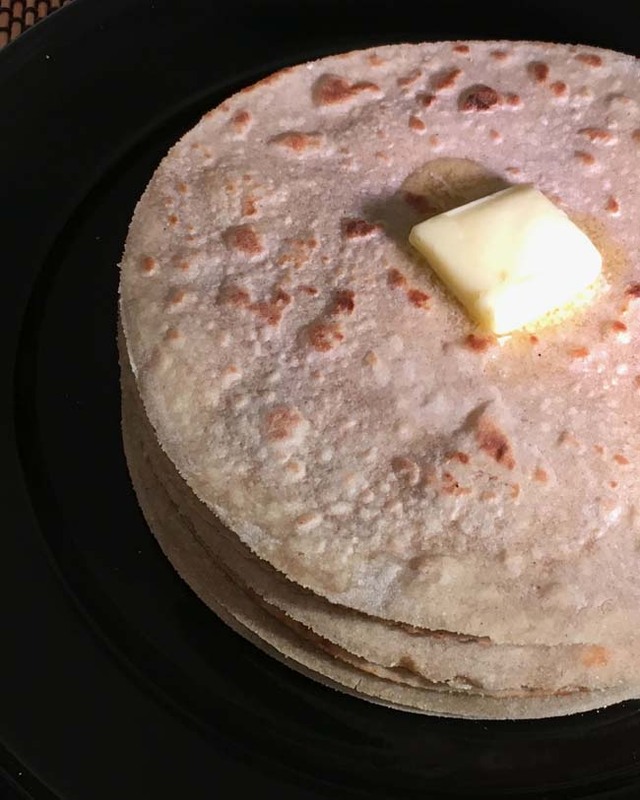 Add enough water into the pan to reach half way up the sides of the cups. .
Place in the preheated oven and bake for 50 minutes to 1 hour (if using different size pans adjust baking times). Open the oven and slightly jiggle one cup. The custard should set but have a little give in the center. If too wiggly, bake for another 10 to 15 minutes before testing again. Remove from the oven and cool on the counter for at least 30 minutes before serving. Alternately after 30 minutes , transfer the custards to the fridge for at least 3 hours . Take out of the fridge just before serving. Kithul Jaggery is made by processing the sap of Kithul palms. Dark brown sugar, Indian Jaggery, Piloncillo are all good substitutes. 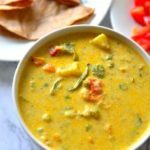 Premium canned coconut milk (not lite) can be used in this recipe, or use the first extraction of freshly prepared coconut milk. Traditionally jaggery is melted over heat with a little water added to it. Once completely melted it is strained to remove impurities before. 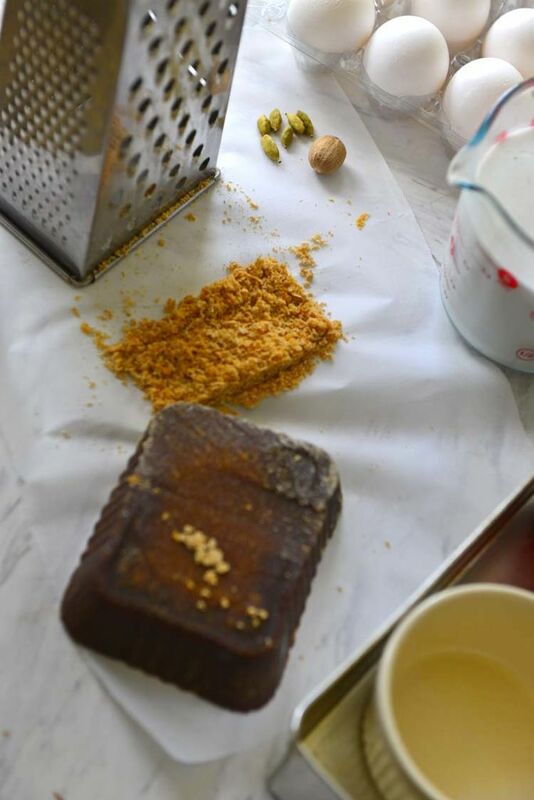 Follow this process if you are not sure about the quality of the jaggery. Wattalappam can also be steamed. Place the containers covered on a steamer rack and steam at medium heat for 30 to 40 minutes. Test and steam longer if necessary. The cooking times vary depending on the container used as well. Thinner custards take much less time than the thick ones. 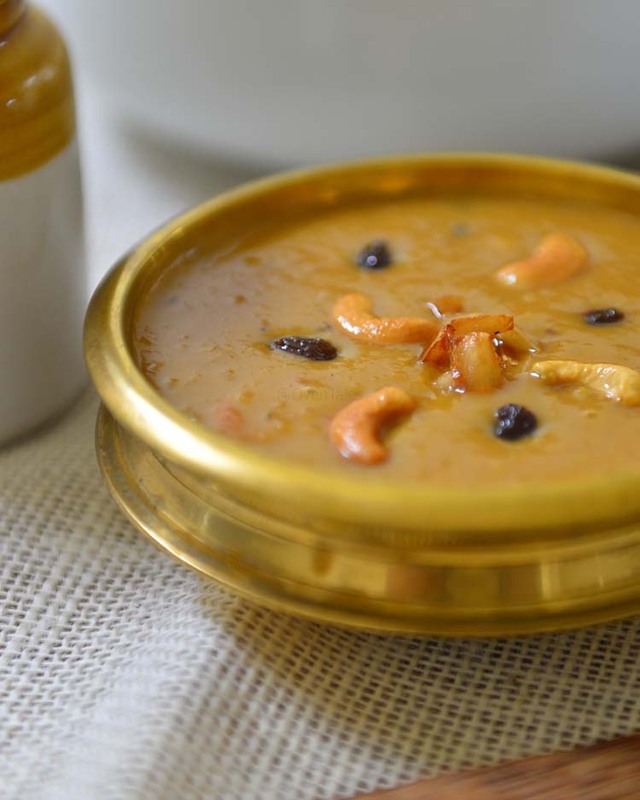 Optionally raisins and cashew nuts are added as garnishes or to the custard mix. I love the flavors in this – I’ve heard of it but yet to try it. That might need to change! Some useful tips in making it too. Thank you ! Hope you try it. The southern region has more non dairy based desserts which are not so well known. Hope you give it a try ! This sounds absolutely wonderful. I’m not sure if I can find the jaggery here in Italy, but if I can, I’d love to try it!